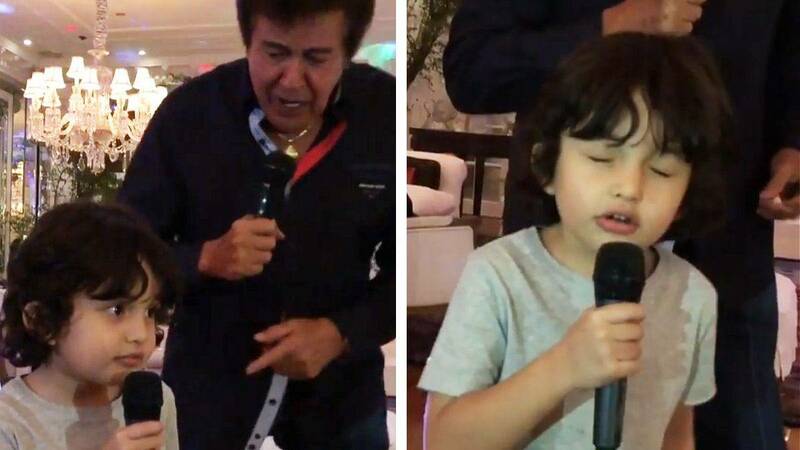 Zion Gutierrez and his grandpa Eddie Gutierrez were a super singing tandem during a family gathering on Tuesday night. Zion's proud mom, Sarah Lahbati, posted cute videos of the two Gutierrezes performing Elvis Presley hits in front of close friends and relatives. And for their encore performance, here they are rocking to another signature Elvis hit "Hound Dog." Earlier this week, Sarah was thrown a baby shower for her second baby boy whom she and fiance Richard Gutierrez have chosen to call Kai. In an interview with PEP.ph, the 24-year-old actress said that the idea came from her, "It means ocean, it was my idea. We always travel and try to visit our beautiful islands. We love the ocean!" On Instagram, she also wrote a heartfelt message to her first-born Zion while anticipating the birth of her second son. Writing on the caption, she said, "The day you came into my life, I knew what my purpose was… to love and protect with everything I have. And with your little baby brother Kai arriving soon, I promise to do the same for him—give my all, love unconditionally, and protect the both of you without ever making you feel left out or unappreciated. Je t'aime avec tout mon cœur, Zion."